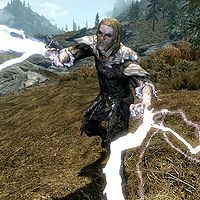 The Challenger is a Breton wizard who is randomly encountered in Skyrim (or SolstheimDB). He wears fur armor and a leveled pair of light boots, and he carries a dagger, along with various potions, poisons, and other items depending on his level. When you first encounter him, he will call out to you "You call yourself a wizard? I challenge you to a duel!" If you decline the duel, he'll respond "I won't take no for answer!" If you accept by saying "It's your funeral. ", he will reply "The gods will be the judge of that." Either way, you're in for a fight. "Stop it! This is a one-on-one duel!" "I thought you were a wizard. Hit me with a spell!" "It's no fun unless you fight me with magic." "This is a magic duel. Ma-gic. You know, with spells." This page was last modified on 15 August 2016, at 19:25.